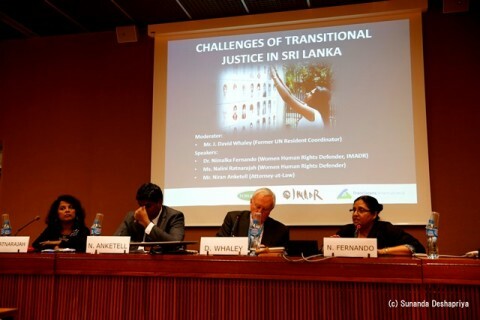 On Thursday 17th March, jointly with Franciscans International and Asian Forum for Human Rights and Development (FORUM-ASIA), IMADR held a side event on “Challenges of Transitional Justice in Sri Lanka”. 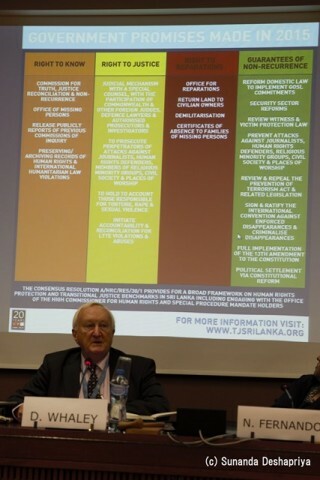 Mr. J. David WHALEY opened the discussion with his appreciation and congratulations to the civil society of Sri Lanka including Tamil diaspora for the series of three resolutions on Sri Lanka at the Human Rights Council (HRC) during the difficult period. He reminded that it started from the disappointment in 2009 after the end of conflict. He then shared the infographic “Transitional Justice in Sri Lanka” created by the Centre for Policy Alternatives (CPA). Following the introductory remark, civil society representatives from the country shared their perspectives on the current process. First speaker, Dr. Nimalka FERNANDO, stressed that the experiences and expectation of communities inside the country have to be looked at in order to assess the ongoing transitional justice process. She pointed out that the controversy of the issues which the former regime resisted such as addressing the war, discussion of Sri Lanka at the HRC and halting the prosecution of Tamils still remains strong in the country. She gave her analysis that transitional justice in Sri Lanka includes rebuilding of a new democratic state while addressing past violations, which has posed challenges to political leaders. She shared her difficulty to translate the term “transitional justice” in Shinhalese for victims to understand the concept. She emphasised that the Government of Sri Lanka needs to respond the HRC resolution “Promoting reconciliation, accountability and human rights in Sri Lanka (A/HRC/RES/30/1)” substantially. She also reminded that civil society should critically engage with the Government in implementation of the HRC resolution. She shared her challenge to understand and respond to the expectations of victims for transitional justice. She acknowledged the delay in the Consultation Task Force as it needs to look at the expectations of victims. She reminded that the civil society has a responsibility to engage with the Government in order to deliver justice, since it also worked for the political change. Second speaker, Mr. Niran Anketell, laid out the challenges of transitional justice in next few months. First, there is an urgency of the need for reform. He shared the concern on a possible split of the coalition Government after the completion of the Constitutional reform, which is likely to deter the transitional justice reform. He therefore stressed that the transitional justice reform has to be done within 2016. Second, he highlighted that the momentum of transition cannot be missed. He pointed out that “honeymoon period” of transition is over in Sri Lanka in which a sense of urgency is now required to bring forward the consensus made for transitional justice. He emphasised the need of continuing international engagement and pressure, since bureaucratic resistance to changes is persistent. He listed the examples of the Witness and Victims Protection Bill, criminalisation of enforced disappearances, demilitarisation and land return. Third, he regretted the absence of progress in demilitarisation apart from the immediate action soon after the political change in 2015. He concluded his presentation by highlighting the need of urgent actions and continuing international pressure. Third speaker, Ms. Nalini RATNARAJAH, screened the short film which captured the daily struggles and stigma faced by female ex-combatants of Liberation Tigers of Tamil Eelam (LTTE). Ms. Ratnarajah explained the reason why she focused on the Eastern province was because those ex-combatants are totally neglected. She also shared her difficult experience in making the film due to the unwillingness of people to cooperate for fear and continuing surveillance. According to her, former female ex-combatants are excluded and isolated from communities. She explained to the audience that the lack of means of female ex-combatants for living such as education, vocational skills and lands traps the women in poverty. Most of their husbands abandoned them with children, which has made their situation harder. She pointed out that the interviewees in fact voted for the President Sirisena and the coalition Government in the high hope to receive livelihood support and truth for their missing family members. However, the support from the State remains insufficient and the women continue to live in fear. She concluded that transitional justice for female ex-combatants means compensation and livelihood assistance. Before opening the discussion for questions and comments, Mr. Whaley agreed that there is a need to address the trauma and rebuild the lives of victims. He stressed, “Transitional justice denied is not transitional justice”. One participant asked the panellists about what are immediate actions to be taken in order to bring progress in implementation of the HRC resolution. Mr. Anketell responded that such actions should have been taken by March 2016 and the current discussion should have been on further measures. He suggested that reparation measures can be provided as part of confidence building measures for people to engage with the transitional justice process. He also raised the issue of sequencing in the Government. Another audience asked the panellists how the Government can bring the transitional justice process forward while the former President’s force remains visible. Dr. Fernando shared the frustration of civil society for the slow progress. She reminded that one of the challenges for transitional justice is to win the Sinhala constituency, since accountability is for all communities. She stressed that every stakeholder should live with the pledge for truth, justice and reconciliation. Lastly, one of the participants asked for the update on the Consultation Task Force. Mr. Anketell explained that the Task Force was not sufficiently funded until recently. He regretted that consultations were not complete in March and civil society members are made responsible for the process. In the concluding remark, Mr. Whaley welcomed the continuing critical engagement by the civil society of Sri Lanka to implement the HRC resolution. * Photo credit: Sunanda Deshapriya.